Mock Orange (Philidelphus lewisii) – Rhythmically releases emotional residue from your cells. Then rewrites your cellular energetic patterning to align with new healthier emotional states. I AM rhythmic repatterning from old habits to new healthy emotions. Mock orange is a Pacific Northwest native deciduous perennial shrub. White flowers grow in 4-5 petaled clusters and smell lightly of orange blossoms. 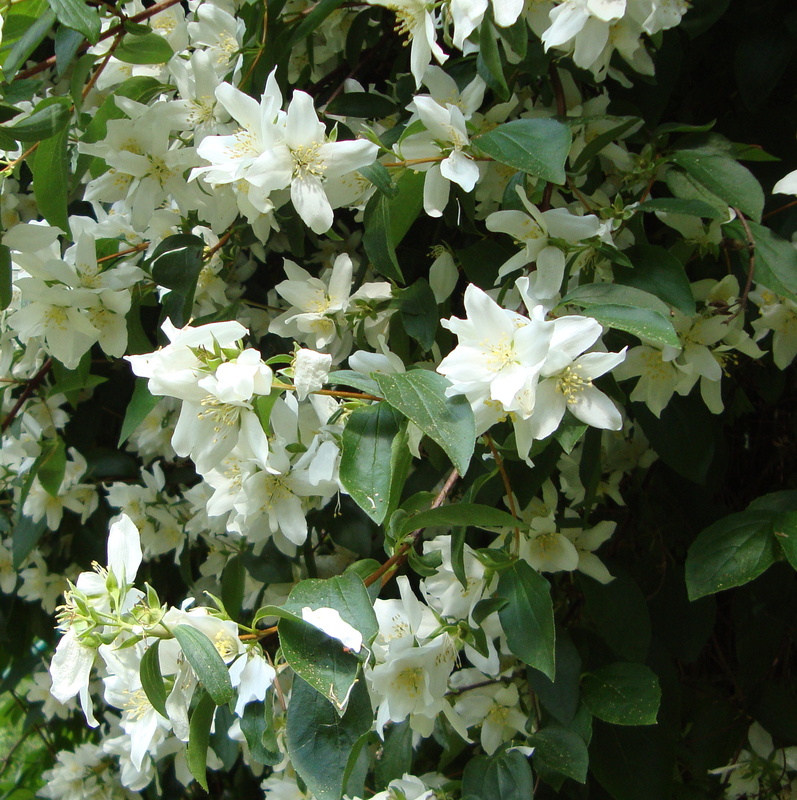 Mock orange has very hard wood from which indigenous people made combs, netting shuttles and knitting needles. It provides valuable cover for ground birds on open sites, forest edges, or at the base of evergreen trees. Use Mock Orange Flower Essence when you are stuck in old emotional patterns often relating to anger, fear, lack of self-esteem or being inflexible. These ingrained biochemical patterns often served as a survival mechanism during traumatic or abusive situations, but are no longer useful. As you heal, the previous emotional survival patterns hold back your personal/spiritual growth. Sounds of drumming, rattling, and spirit song coming through Diana's voice were infused into the Mock Orange Flower Essence as it was being remade. The use of sound strengthens the way that this essence works. Similar to the healing from drumming and ritual, Mock Orange Flower Essence energetically releases habitual emotional patterns and aligns you with new healthier emotional states by energetically changing the communication between your nerves, cells and biochemistry. This essence was made by the no-pick method. While the essence was being made, crystals of amber, blue quartz, red jasper, sodalite, smokey quartz and drusy quartz were placed among the plants with the storage (mother) bottles. The sun acts as a transformer to step down spiritual energies from higher dimensions. While the essence was being made, Amber acted as a lens to receive and focus sunlight for this purpose. Blue Quartz assists you to release emotional stagnation, and its comforting resonance supports you to feel more emotionally free. Red Jasper helps you remember that you are the creator of your decisions. It assists you progress instead of digress in your life. Sodalite helps you to shift from experiencing your world through worry, anxiety and stress and instead to envision your life from a more serene perspective. Smokey Quartz is grounding, purifying, and protective while helping you to utilize higher frequency energies. Drusy quartz energizes and stabilizes your subtle bodies. The actions of the crystals inform the way this flower essence seats into the physical body. As the process of making Mock Orange flower essence was nearing completion, sounds of drumming, rattling, and spirit song coming through Diana’s voice, were infused into the essence.